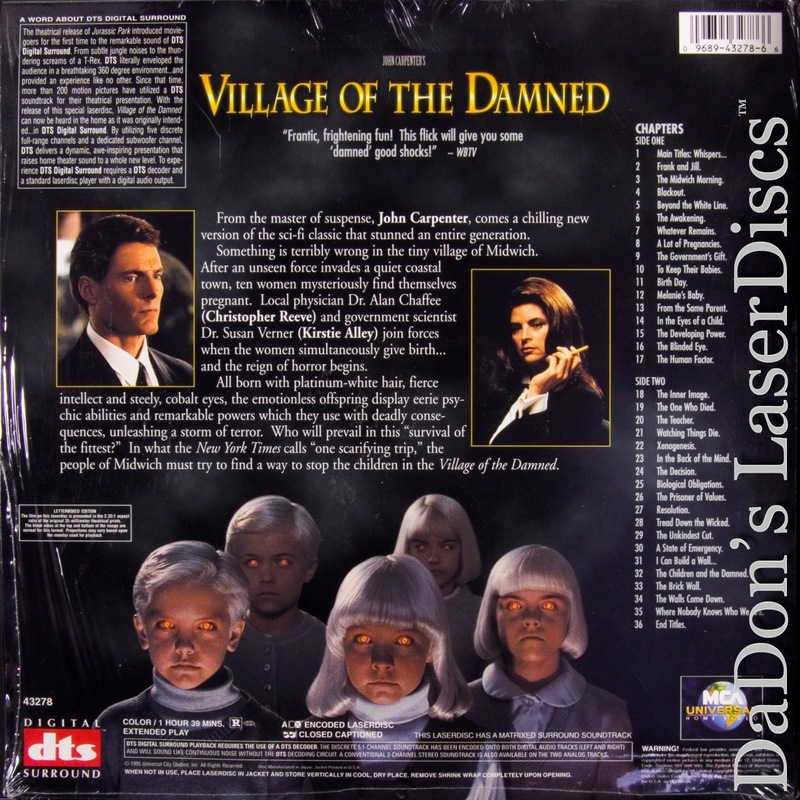 Village of The Damned 1995 - 99 min. 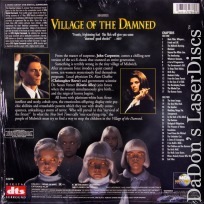 - Black and White Genre: Horror Rated PG-13 Country: USA LaserDisc Movie Storyline: The third remake in John Carpenter's career (after MEMOIRS OF AN INVISIBLE MAN and THE THING), VILLAGE OF THE DAMNED comes from the novel, THE MIDWICH CUCKOOS written by John Wyndham, and the 1960s black and white film about the horrors of the nuclear age. Updated and spiced with the usual Carpenter edge, this remake is every bit as scary as the first one. 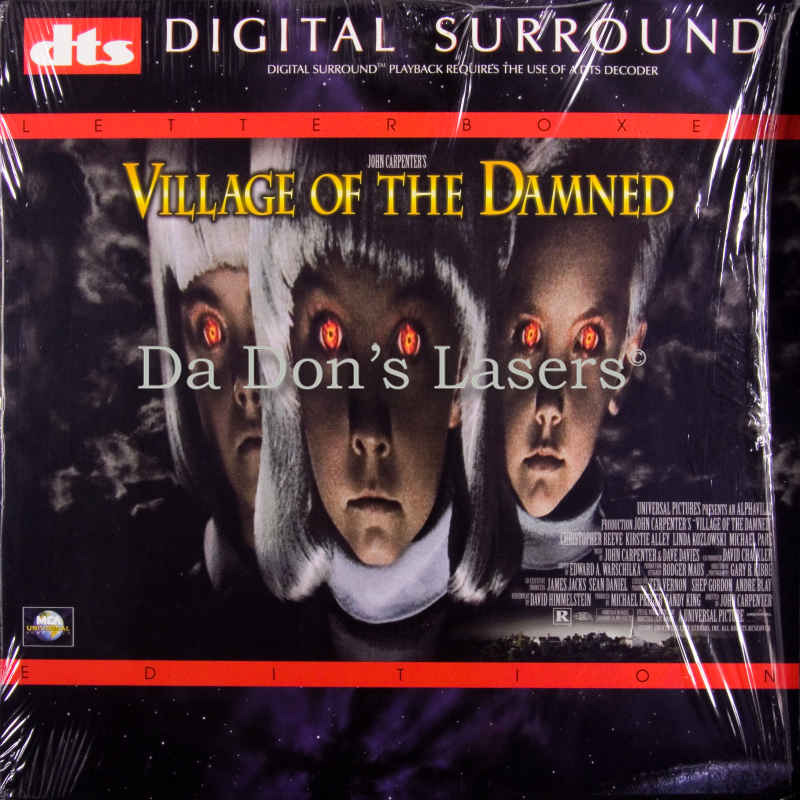 In a sleepy town, ten strange children are born at the same time, all of them possessing platinum blone hair, piercing green eyes and supernatural powers. The intelligent, quiet children are disliked by the townspeople, and when people begin to die the first suspects are the "special" children. This was the last film Christopher Reeve made before his tragic paralysis, and he gives an excellent performance as one of the doctors who must stop the children from destroying the town. Once again John Carpenter creates a horrifying film with his talent for mood and unexpected frights, proving once again he is a modern master of horror.